More big cities seem to be realizing the value of plants and landscaping as a way to create more human-scaled, safer and more attractive environments. 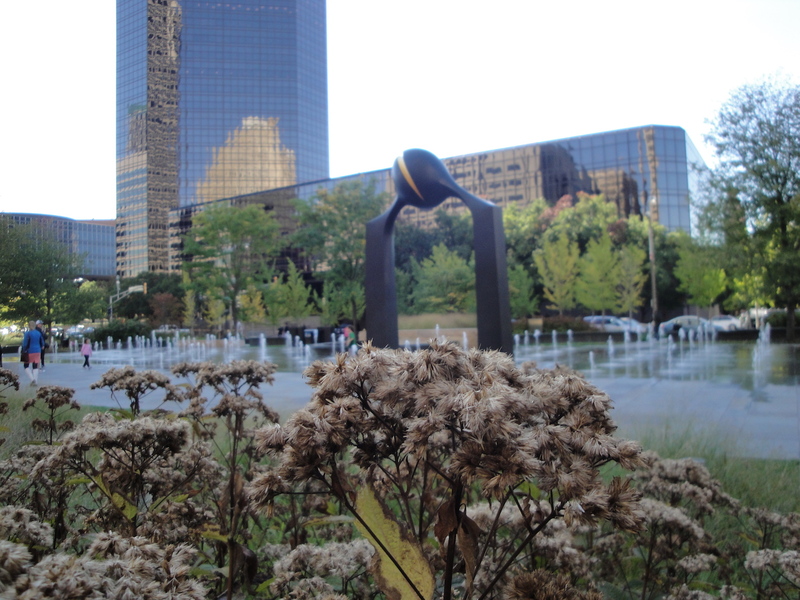 Last weekend, I toured the Citygarden Sculpture Garden along the Gateway Mall of St. Louis with two dozen garden writers as part of a regional Garden Writers Association meeting. St. Louis seemed especially vibrant and lively, which may have had something to do with the beloved Cardinals winning in the National League Championship Series, but it also could be due to private and government efforts to bring plants and landscaping into the city core. On the night before the official tour, I walked downtown to enjoy the pregame excitement. The Gateway Mall’s many tree-covered patios were filled with music, food and happy baseball fans. The medians along Market Street were lush with lantana, cannas and begonias. These are the work of a large group of individuals, companies and organizations united under the name Gateway Greening. Check out the website to see a list of plants. Wow! The idea of a Gateway Mall started at the turn of the 19th Century when St. Louis was a thriving city. Bad times in the mid-20th Century left the area shabby and unfinished. Beginning in 1999, the city has responded to a revitalization of its downtown by creating a master plan (now much realized) for the long mall, which runs about 10 blocks between two major streets. Our tour focused on Citygarden, a three-acre sculpture garden, which was opened in 2009 and is a project of the Gateway Foundation, a private family-run foundation. The garden features sculpture by more than a dozen artists and it is completely open, meaning visitors can touch, lean on, walk through and otherwise explore the art. 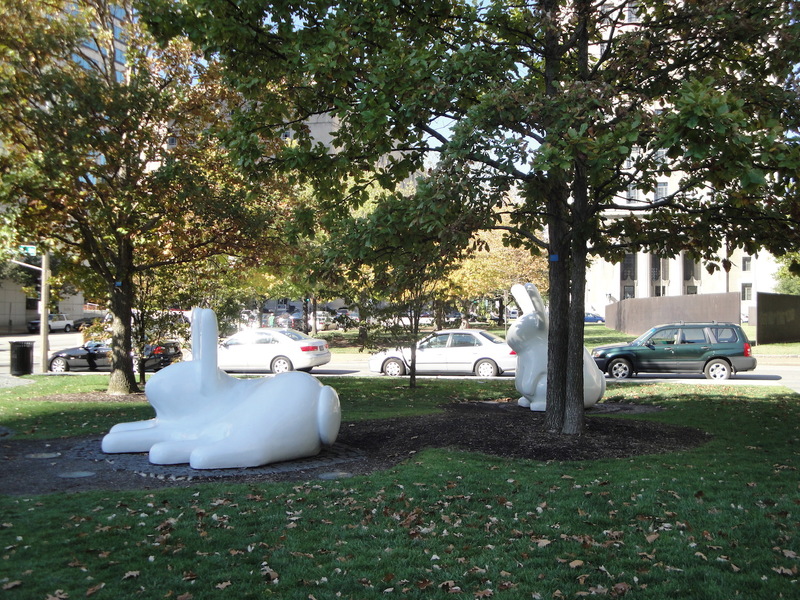 The St. Louis Citygarden is a sculpture park surrounded by parks and gardens. Three aspects of the garden make it a magnet for community activities. First, the designers decided the area should have 50 percent shade coverage as soon as possible, a great idea given St. Louis’ wicked hot summers. To achieve that, many large trees were moved in and planted in a special medium. The garden is essentially one big planter. Trees were chosen for their ability to stand up to these conditions and include sugar maple, dogwood, and 17 Missouri native tree species. To provide shade, trees with large trunk diameters—up to 16 inches—were moved to the site. Secondly, the designers created meandering planters about 2 feet high that weave through the garden. From the above, they remind viewers of the curving rivers leading into the Mississippi near St. Louis. The planters are a perfect spot for folks to sit and enjoy a picnic lunch in the garden. The gardeners have been careful to select plants that can handle the urban environment and the voracious rabbits that haunt downtown St. Louis. (Apparently, the rally squirrel is not the only critter living near Busch Stadium.) Moreover, Citygarden backers have invested in care of the area, so those planters are regularly cleaned and when rabbits go after a particular plant, it is replaced with something less appealing to bunnies. Finally, the planners added water, water and more water to the design, and the fountains are mostly open, allowing children and weary adults to indulge in a cool break from the day. Water, shade, flowers and a place to sit — what more could any downtown worker or resident ask for? The garden has received several awards, including the Amanda Burden Award of Urban Land Institute. 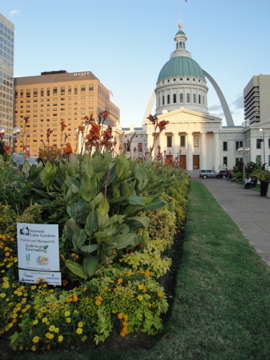 If you visit St. Louis, be sure to stroll through the garden to admire the sculpture and the power of urban gardening. Sometimes I wonder if the bunnies in my yard are as big as this sculpture. It is wonderful that cities are becoming more aware of the value of green spaces to the health and vitality of a city.